On the front page of this morning’s New York Times, below the fold, I read Guy Carawan’s obituary. I hadn’t thought about him in years but mainly associated him with the circle around the Highlander Folk School, but the tribute focused on his role in spreading “We Shall Overcome”. Carawan was white, the child of southerners, and in the ’50s, he became connected to Highlander, an interracial training ground for activists. 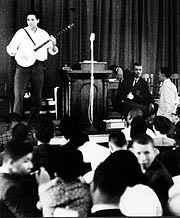 How “We Shall Overcome” found its way to Highlander is a matter of dispute, but what is indisputable is that Carawan heard the song there, and a few years later, introduced it to a group of students fresh from the Woolworth’s lunch counter sit-ins as they gathered for the founding convention of the Student Nonviolent Coordinating Committee. So…anyone find this strange? A white man teaches black freedom fighters their anthem. Apparently, they sang along. These days, it’s hard to imagine a response uncomplicated by questions of authenticity and privilege, the same way that it’s hard to imagine white organizers like Bob Zellner or Casey Hayden working side by side with black organizers in some of the most dangerous places in the South. A few years ago, Isaias Gamboa published We Shall Overcome: Sacred Song on the Devil’s Tongue, attributing the “We Shall Overcome” to a black woman, Louise Shropshire. Shropshire was a friend of Martin Luther King’s, and she certainly visited Highlander. 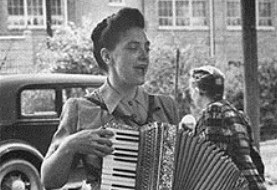 She wrote her gospel song (“If Jesus wills/I do believe/that I’ll overcome someday”) in 1933, and it carries a 1954 copyright. Gamboa asserts that it was stolen from her by what he calls the Folk Mafia. If there is a Folk Mafia, I’m a member of the family, or at the very least, under their protection. 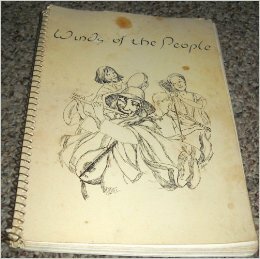 Sometime in high school, I got hold of a cheaply printed songbook called Winds of the People. It had a beige cover featuring a Mayan woman playing what looked like a nose-flute. The book was crammed with lyrics and guitar chords to everything from “The Land is Your Land” to “Geronimo’s Cadillac.” They must have been in violation of hundreds of copyrights. Eventually, the authors cleaned up their act, and printed a more legitimate version: Rise Up Singing. I sing a lot. I grew up singing. My older brother and sisters all knew how to play guitar, and in particular, I owe a lot of my political education to Phil Ochs. At a pre-launch donor party for my novel Waveland, my brother Steve played “Power and Glory” and “There but for Fortune”, and I realized to what extent my fixation on SNCC and Freedom Summer grew out of where that music takes me. Maybe it takes me back to people like Guy Carawan, Pete Seeger, and the wonderfully named Highlander founder, Zilphia Horton. They didn’t think of music as fixed property. By definition, no good song had an origin or end-point. In that sense, songs are like revolutions. Certainly, there’s a kind of arrogance to ignoring issues of authenticity, playing Jonny Appleseed and spreading music without considering whether we are planting native species. But it’s worth asking if we can recapture some of Carawen’s unselfconscious insistence that all struggles are shared struggles, and that if we’re going stand up for something, we ought to rise up singing.